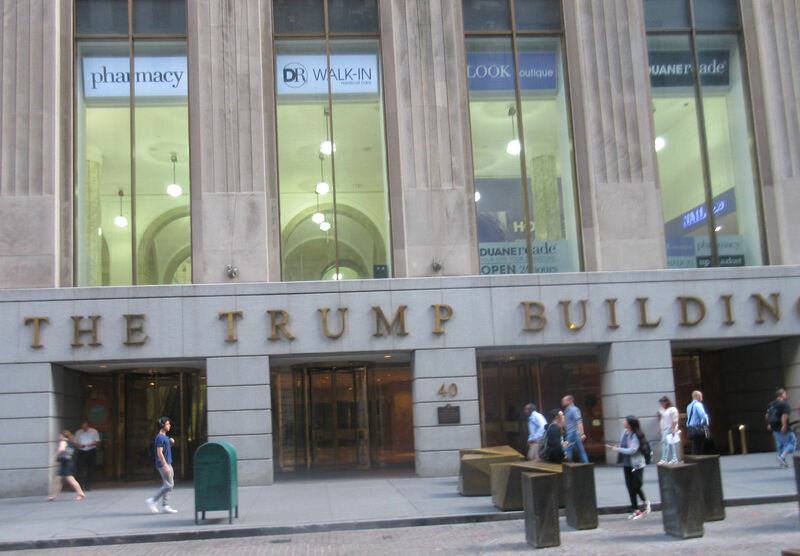 2016 NYC Photos #8: Washington Clocked In Here « Midlife Crisis Crossover! After a pretty but not necessarily hearty breakfast (more about that in a future entry), we took the #3 train south into the heart of Wall Street, where 20th-century skyscrapers dwarf a 19th-century structure with more historical importance to its name than all its neighbors combined. That goes double for this one, which we scurried past without stopping. 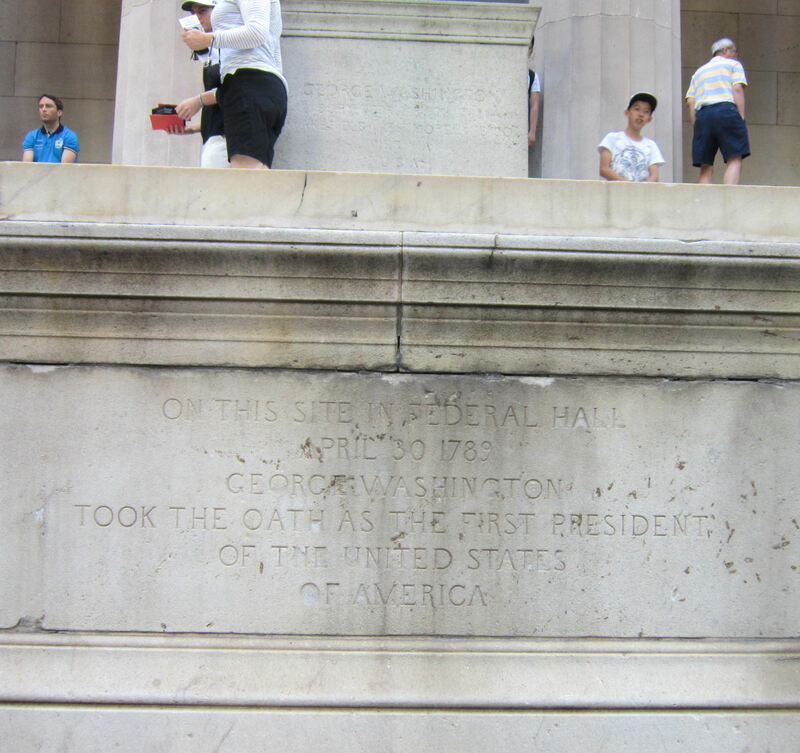 The building’s full name is Federal Hall Memorial National Historic Site. The first building erected on that site circa 1700 served as New York City’s city hall, then as the first U.S. Capitol Building, then as City Hall once again when Congress moved to Philadelphia. It was demolished after the grand opening of the current City Hall in 1812, then replaced by the 1842 structure that remains standing as of today, thanks in part to occasional renovations (particularly after the faraway shockwaves of 9/11 rattled it some). Though the stones have largely been swapped out, one fact remains the same: on this plot of land, General George Washington was sworn in as the first President of the United States of America on April 30, 1789. 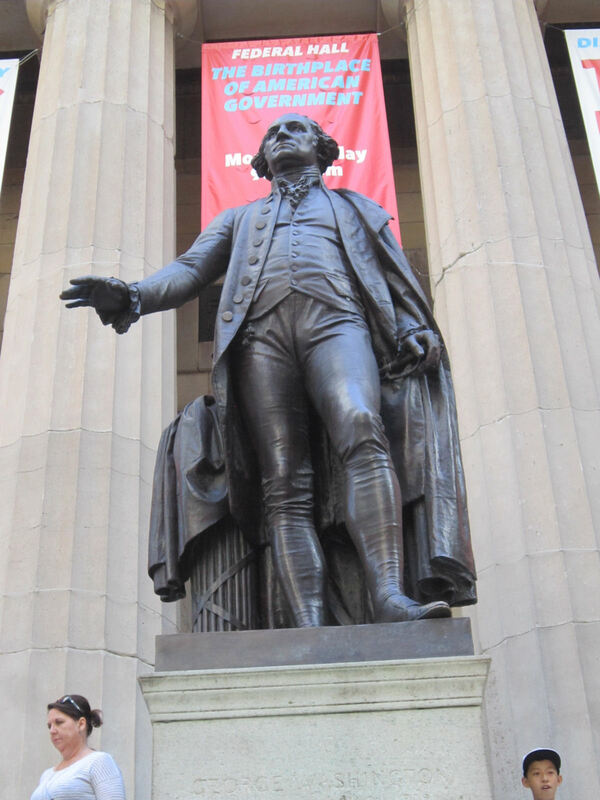 His bronze statue dates back to 1882, a bit before the first inauguration’s centennial, and stands roughly where Washington stood on that proud day, except he was higher up in a balcony. The TL;DR version: Washington’s New Job Began Here. 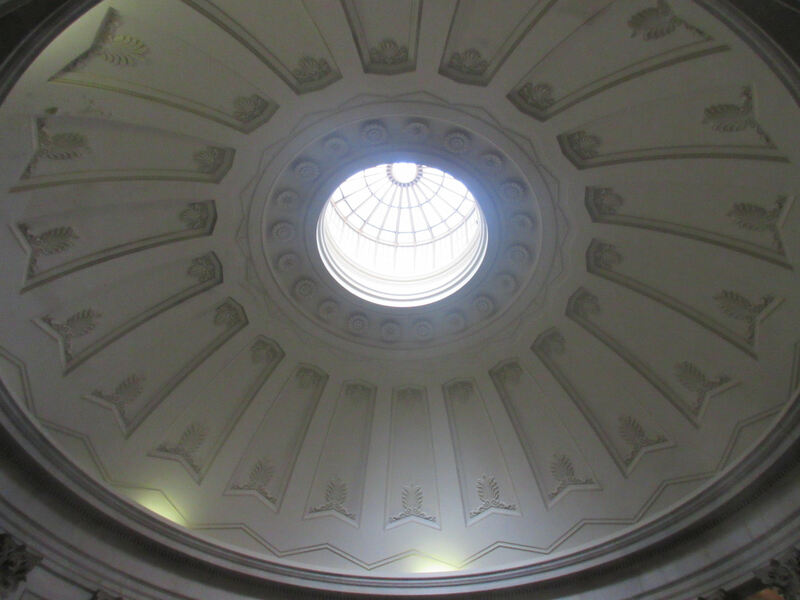 Greco-Roman architecture stylings inspired its planners to fill the place with columns and top it with a dome worthy of a small state capital. 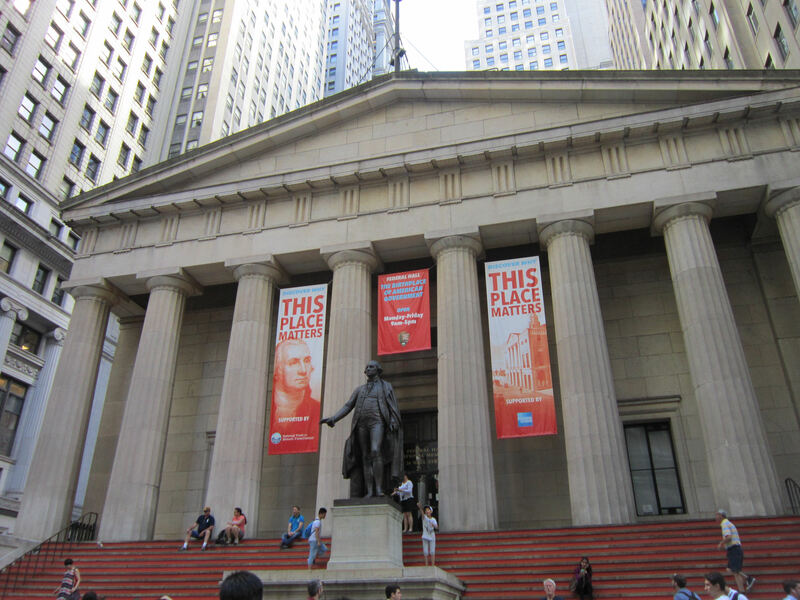 The 1842 Federal Hall first served as a Custom House, then as one of six Sub Treasury buildings when those were a thing predating the Federal Reserve. It’s been a historic site since 1939, a national memorial since 1955, a duly designated Historic Place since 1966, and a responsibility of the National Parks Service for some decades. 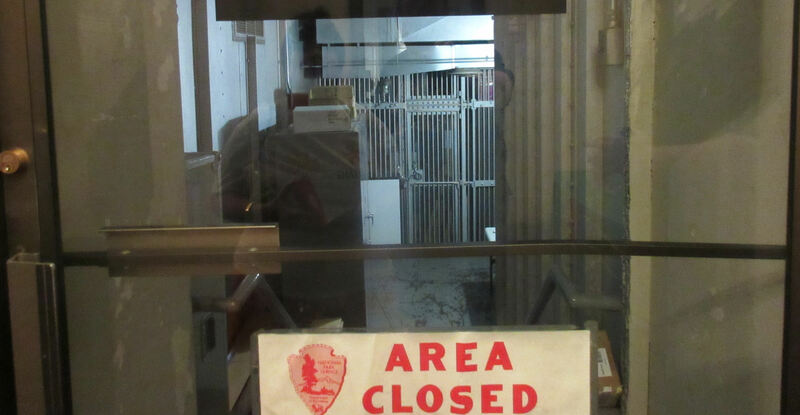 Coin vaults are among the few reminders of its Sub Treasury days, though they’re closed off to the public because we’re too greedy to merit all-access to where our monies used to be. 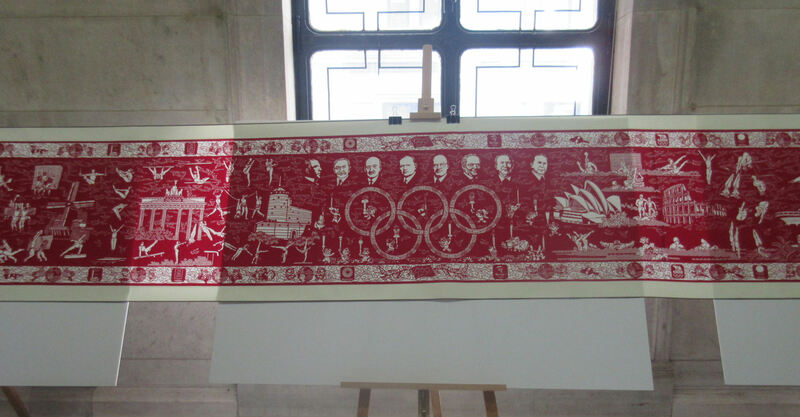 Much of the first floor was taken up by an exhibit of Chinese art — some contemporary, some from previous ages. I’m not sure if the collection was meant to tie in to other events or if it was an easy subject to acquire, what with Chinatown a mile or so down the road. 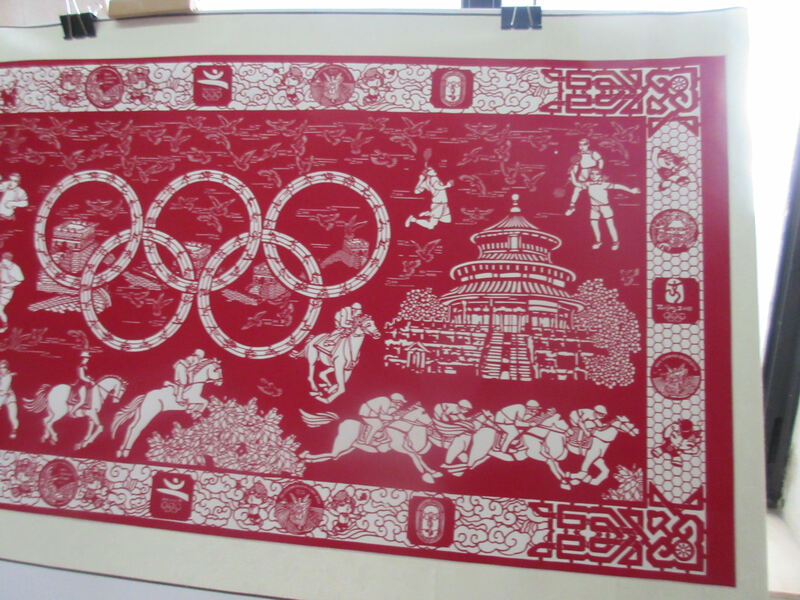 Banner art titled “From Athens to Beijing” celebrated the history of the Olympics up to 2008. Capturing the entire piece in a single shot proved unworkable. I wish I had more detailed information to impart for some of these pieces beyond “I think this looks cool”, but sometimes I’m in the mood to gaze and contemplate and not take notes. 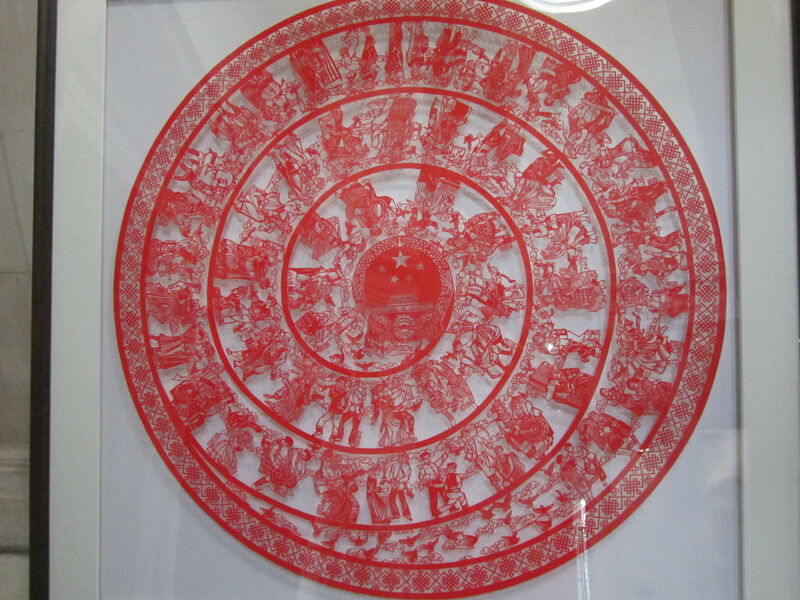 Chinese art wasn’t our primary objective. 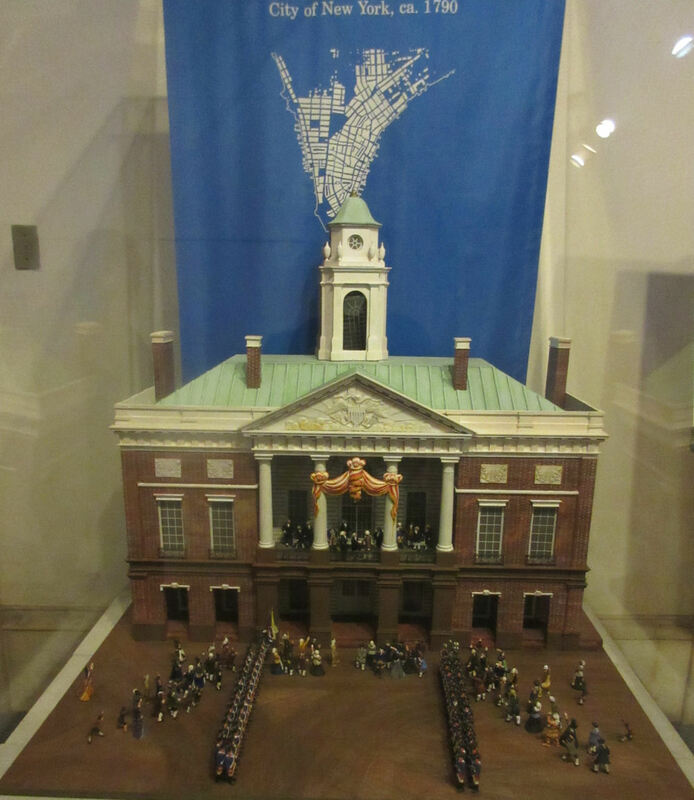 We had history to bask in, as demonstrated within this diorama of the original Federal Hall circa 1790. If it makes history come alive for you, feel free to pretend the tiny American figurines are singing tunes from the Hamilton soundtrack. A selection of permanent exhibits highlight American life at the dawn of the nineteenth century, with authentic remnants from the era preserved on display. 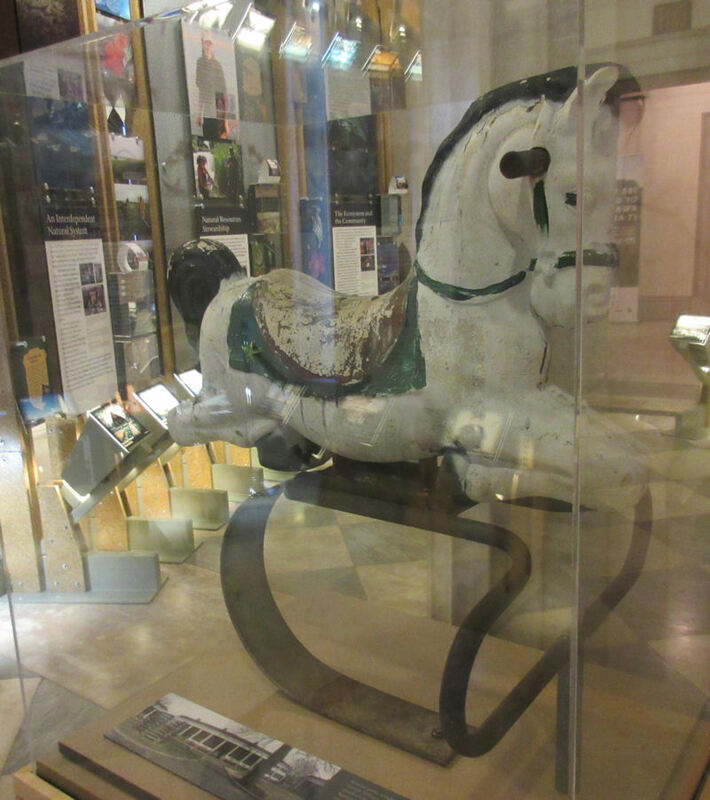 Souvenir rocking horse from the grounds of Fort Jay, formerly one of NYC’s first lines of defense. Two of Washington’s own waistcoat buttons are reminders of his invaluable service during the American Revolution. As far as Anne and my son were concerned, the main attraction was the King James Bible upon which Washington was sworn into office by Robert Livingston, Chancellor of New York. Not a replica. Not a hollow cardboard fake. Not a Bible like the one Washington used. Not a sculptor’s dramatization. 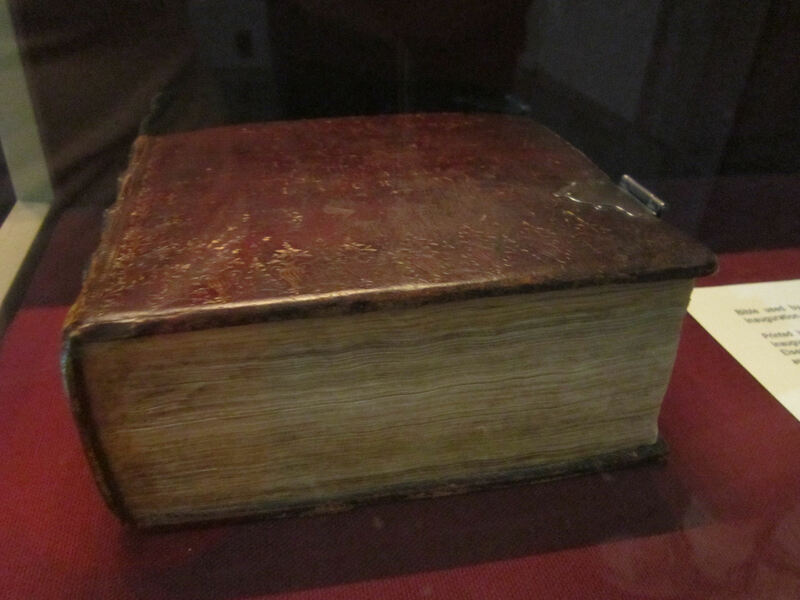 This was THE Washingtonian inauguration Bible, a thing actually touched by America’s first President. I understand this edition included the Apocrypha, but the glass case prevented any investigative browsing. 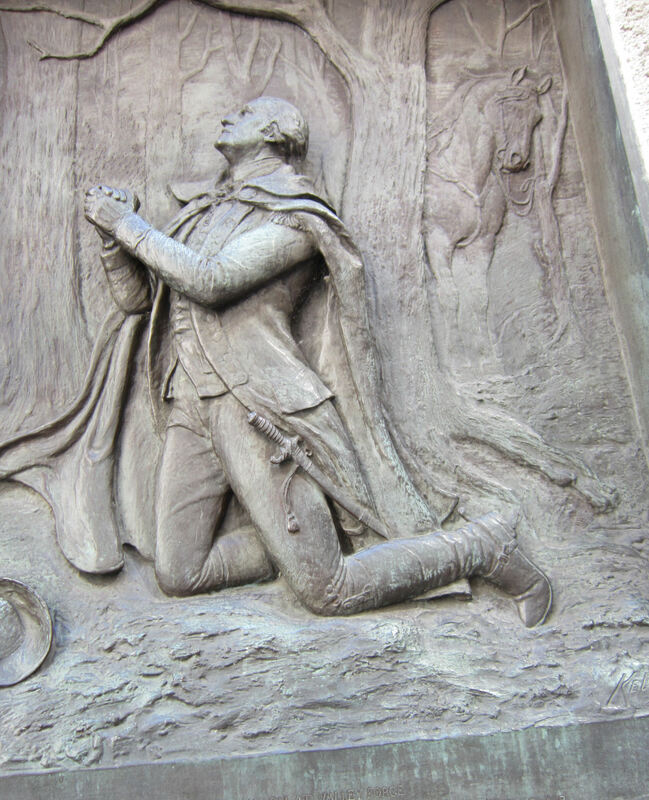 On the front of Federal Hall, over on the far right side, a brass relief captures Washington’s image in a moment of prayer. Once upon a time, that was a thing Presidents might do in public. And mean it. Good luck finding art remotely like this on any of our 2016 electoral candidates’ holdings.